I was prompted to add The Screaming of the Innocent to my global reading challenge list by this excellent review at Petrona. My short summary review would simply be: read the book yourself, you’ll be glad you did. 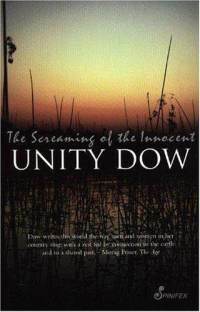 The Screaming of the Innocent is set in the author’s native Botswana and tells a harrowing tale about a young girl who goes missing, the men who are responsible and the ease with which they engineer a cover up of their actions. The girl is 12 years old and one day she is spotted playing with her friends by a local businessman, Mr Disanka, which seals her unfortunate fate. He calls upon two men he knows who share his heinous interests and together they plan what they’ll do with the girl. Although at this point there is no graphic depiction of what is done to the girl, the passage in which this odious individual, who is thought to be a good man despite his many mistresses and other moral lapses, identifies the girl as ‘perfect for his purposes’ quite literally made my skin crawl. We then jump forward five years and meet Amantle Bokaa, a young woman in her 20s, as she begins an internship at the clinic in the same village from which the girl disappeared. When carrying out some cleaning at the clinic Amantle finds a box marked Neo Kakang: CRB 45/94 and when she tracks down the village resident who shares the name Kakang the box is opened to reveal a set of blood-stained clothes. The villagers, including Motlatsi Kakang, are stunned because the clothes clearly belong to Molatsi’s daughter Neo who went missing five years earlier. They were told at the time by police investigators that the girl had been killed by lions. Amantle, being a remarkably strong young women, then takes it upon herself to uncover the facts behind Neo’s disappearance and what she soon realises must have been the official cover up of those facts. The subject matter of this book is undoubtedly dark but, because it is based on a real case of ritual killing, there is a purpose to that darkness. This is not gruesome violence for the shock value of it like so many ‘thrillers’ contain these days; this is actually quite a restrained depiction of events which will keep occurring in the real world unless they are exposed in this way. But perhaps the most important thing to know is that despite the utter wretchedness of many of the events in the book there is a sense of optimism and hope too. The introduction of Amantle and the friends she co-opts to her cause is a master stroke on the part of the author, allowing the reader to imagine the possibility of a brighter future for Botswana and its poor people, especially its women. For Amantle is a delightful character who, as the youngest of seven children in a traditional Botswanan family, was selected to be the first one who would go to school. We learn via flashback some of Amantle’s personal history and it becomes clear how she developed into such a smart and resourceful young lady who is prepared to stand up for herself and those she identifies cannot do so for themselves. She is not entirely alone, engaging the help of a young female lawyer friend who in turn ropes in another chum or two and you get the sense that the author sees these young people as a big part of her country’s future. This is one of those books that oozes its setting, both physical and psychological, from every page. The traditional values which are increasingly at odds with modern thinking, the entrenched poverty, the heavily hierarchical social structure in which women at each layer have to struggle more for their share of what is in offer are all present. But so are the beauty of the landscape, the strong sense of community that develops among the rural villages and even, albeit briefly, some flashes of humour such as when the young people have to spend a night camping and the city-living lawyer is terrified they will all be eaten by lions. If the book had depicted only a single note of despair and sadness I would, I think, hesitate to recommend it but knowing that it also contains the seeds of reason to be optimistic I do think it’s well worth reading. It is emotionally harrowing (the ending particularly so) but not gratuitously so and, on balance, I am glad that I read the book, despite the sadness and sense of impotent outrage it engendered. As well as being a writer Unity Dow is a human rights activist, former High Court Judge and earlier this year was nominated as one of Newsweek’s 150 women who shake the world. This entry was posted in book review, Botswana, Global Reading Challenge 2010, Unity Dow. Bookmark the permalink. This is a brilliant review, Bernadette. Once more, you show great insight and have truly “got” this book- even terrible darkness cannot win over constructivism, optimism and courage of convictions. It’s both a shattering and inspiring book. I was actually so shaken by it that I did not think my review was very good at all, I think I have never been quite as upset by a book as this one – Box 21 by Roslund-Hellstrom made me very angry but I think this one goes even deeper. Thanks for your wonderful analysis. I too was reminded of Box 21 Maxine…I have the same sense of frustration that such things continue to go on…that it doesn’t seem to matter where you turn women are treated like utter crap. Surely the only thing worse than being a poor black man on this planet is being a poor black woman. I read it almost in a single go and then had to wait a couple of days before I could write even remotely intelligently about it…still not sure I said all I wanted to say but the book is short so people can read for themselves. This sounds like a harrowing read that would give me nightmares but also make me grateful that I was born in the U.S. I steel myself to read books like this because if we don’t, the crimes against people, especially women, just continue unabated. I will certainly look for this book and read it. Thank you for the tip. Thanks for this review, Bernadette. I don’t know whether I could summon up the strength to read this one. Box 21 had me very upset at the ending. When she gave us the answer it was five or six! Bernadette – This is really a superb review! This book has been on my “wish list” for some time, and your excellent review makes me want to read it even more. I am definitely going to push this one up on my list. Sometimes, unspeakable crimes like this have to be broadcast to a wide audience so that people know what goes on. It sounds as though this is one of those cases. whether to take on reading this book. I do appreciate reading your very well-stated review.